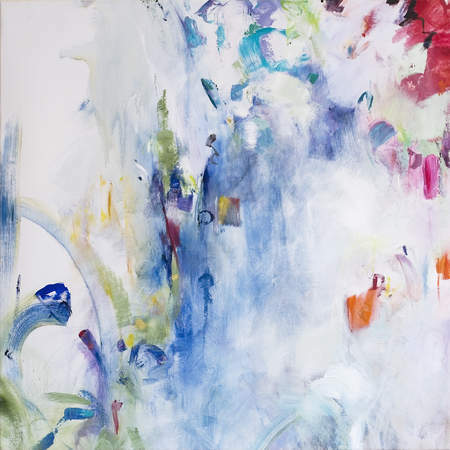 August Artist-in-Residence Peggy Gyulai explores the connections between music and the expressive possibilities of paint on canvas in her work. She listens to and looks at music as a subject, object, inspiration, and—like Richard Diebenkorn—invokes the dynamic tension between the poles of abstraction and representation, creating substance from ephemeral phenomena. My childhood was spent in and around the ocean off Cohasset, Massachusetts on the south shore of Boston. I moved to Philadelphia to study biological anthropology for my undergraduate degree at the University of Pennsylvania. 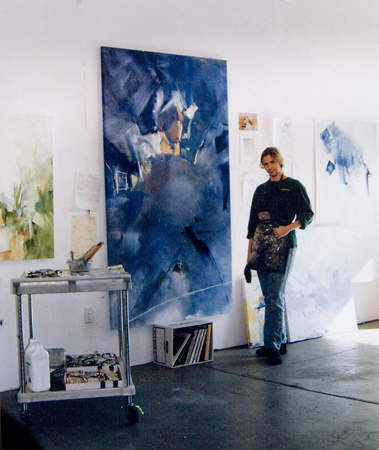 Later, I received an art degree at the Pennsylvania Academy of Fine Arts (PAFA), and I ended up living and working in Philly for 28 years until moving to San Francisco. Where did you receive your art training? I have always drawn since I was a child and I was a photography junkie in high school. We had a world-class teacher and a photo laboratory in a castle (really!) and I didn't touch paint until many years later. My main art training was at PAFA, where I matriculated at the ripe old age of 30. Those four years were the most saturated, immersive art experiences I've ever enjoyed. We lived and breathed life-drawing and painting, sculpture, and printmaking, and I emerged as an equally figurative and abstract painter. In what media do you primarily work? I prefer oil on canvas because it’s the most luscious and flexible medium for the way I work. I also use acrylics, watercolors, and Corel Painter for digital painting, and I have started iPad sketching and painting. I've also created and directed performance works, which are essentially music video visuals that accompany an orchestra performance. How will you engage the public during your residency? I plan to provide tours, talks, and activities that allow visitors to make their own music-inspired paintings, which I then hope to include in a group publication. What or who are your artistic influences? Music is the primary source of my inspiration. My visual art influences include Diebenkorn, Rudolf Arnheim, Jenny Saville, Joan Mitchell, Marina Abramovic, Sargent, Morisot, Whistler, and Rothko. Do you have a favorite artwork at the de Young or the Legion of Honor? Well my favorite artist is Richard Diebenkorn. 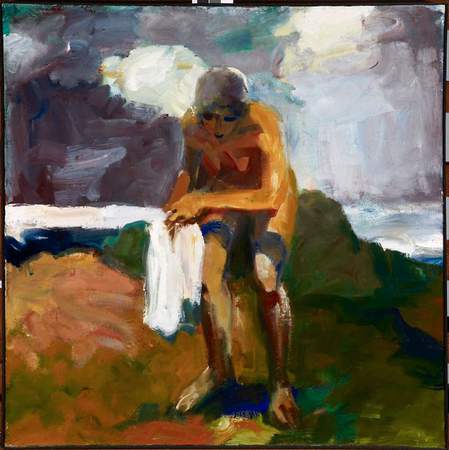 But my favorite painting is Elmer Bischoff's Girl with Towel. I first encountered it many years ago at the Pennsylvania Academy of the Fine Arts in Philadelphia, where I was a student in the early ‘90s. It was one of my favorite pieces in an exhibition called Bay Area Figurative Painters, which first opened my eyes to Diebenkorn, Park, Brown, and the Bay Area School of color, light, and deliberately visceral paint. I would visit this painting every day and meditate on it. To a young artist chewing on the gristly issue of figuration versus abstraction, it was more than just a painting—it was a vast window looking onto future possibility. It also has a direct thematic connection to Rembrandt and the Dutch pictorial tradition. It’s 100% awesome and I intend to visit it like an old friend every day during my residency. A woodworker, pianist, or doctor. Are you an artist full time? 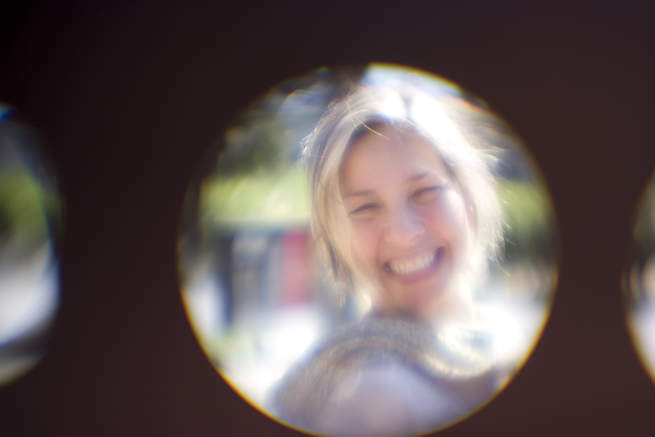 How does living in the Bay Area influence your art practice? When I first moved to the Bay Area I was very much aware that this was the land of Diebenkorn and other important influences. Now that I have been assimilated, I love living here, love the people and the weather in the Mission where I have my studio. I sometimes worry that maybe this makes my art too happy but, it’s an authentic reflection. What is the one museum you’d like to visit? I'd like to get to see the newly reopened Rijksmuseum in Amsterdam, finally! Visit and engage with Peggy Gyulai and her artwork in the Kimball Education Artist Studio Wednesday–Sunday, 1–5 pm (until 8:45 pm on Fridays through November 26, 2013).